Furama resort – Da Nang not only attracts tourists by its convenient location, is located near the city center but it is also a number 1 resort of Viet Nam in particular and Asia in general. 3. 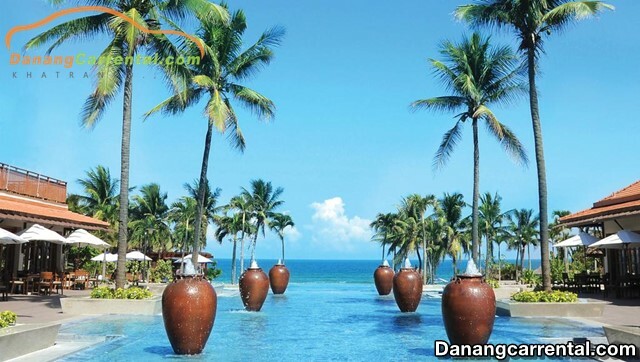 What is the quality of the Furama Resort Da Nang? Furama Resort is one of the most luxurious resorts in Da Nang. When asked about the most impressive when coming to Furama Resort Da Nang, the majority of customer answers is the unique architecture, modern and quality service extremely good. In addition, visitors here can mix with nature so they feel very comfortable and joyful. 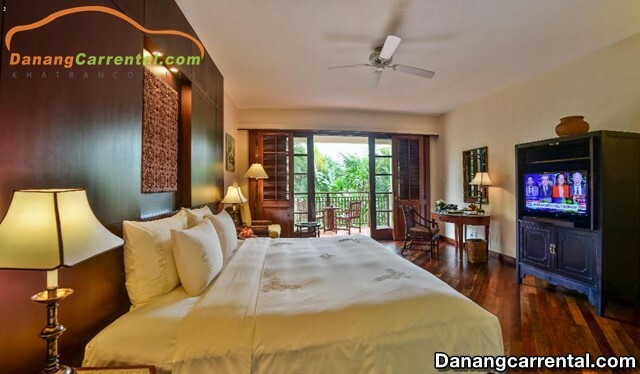 Furama Resort Da Nang is located on Vo Nguyen Giap Street, it located on the beautiful beach of Bac My An with an area of 4 hectares, about 1km long. My An beach is also voted as the most beautiful beach on the planet with long coastline, nice clean white sand beach, blue sea, cool. Furama resort – Da Nang not only attracts tourists by its convenient location, is located near the city center but it is also a number 1 resort of Viet Nam in particular and Asia in general. In recent years, the resort has become a venue for important national events, which host international diplomatic missions. In particular, the Furama Resort Danang is also home to welcoming the family of US President Donald Trump at the APEC 2017 event. Furama Resort Danang was officially opened in March 2007 with a total of 198 hotel rooms. Room architecture is designed in the modern style, luxury but not lack of classical, dignified. Here, you can fully recognize the ancient through every item in the room, such as lamps, tables or chairs. Besides the comfort, softness of the spacious bed or the softness of the sofa in the room. Not only that, the natural flavors of the aroma in the room along with the modern bathroom is made of marble, modern shower is also a big plus for this resort. At early morning, just lightly pull the curtain and step out to the balcony you can admire the sunrise on My An beach. there is no more wonderful than drinking cups of hot coffee, facing the sea to see the sunrise, enjoy the cool breeze and contemplation of life or to talk with relatives, friends really. Furama Resort Da Nang has fresh air, cool space, quiet space and the campus is often trimmed should create a lot of sympathy with customers. If you like to walk in the romantic space, if romantic dreaming if it is a little lazy can stand on the balcony overlooking the lake interwoven with beautiful plants and flowers. However, the best time to enjoy is at night, when the lights shine on the scenery sparkling and fanciful, beautiful strangely. If there is a chance to enjoy the food here, sure that there is no point can be blamed. 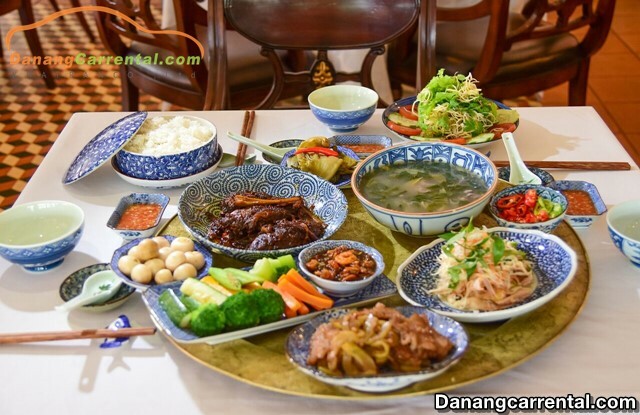 Because of the rich menu, the dishes are thoroughly processed, unique, fresh food that is very reasonable prices. Buffer dinner with the enthusiasm of the restaurant staff are highly rated customers. The drinks here are also delicious, so do not forget to drink a cup of coffee or another drink after a meal at Furama Villas Da Nang. 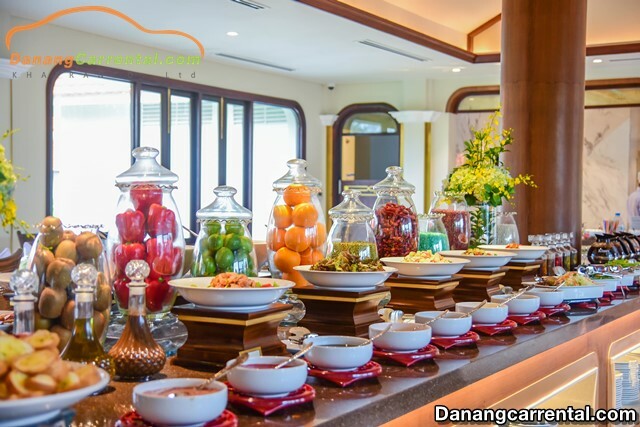 Not only delicious food, exotic drinks, swimming pool facilities that other services are also very Da Nang Furama Resort such as gym, spa, children’s entertainment area, cinema movie, library reading … Especially, facial massage services in the sauna or swimming pool are very interesting. If you travel and do not want to touch the cleaning or laundry, there are Resort staff to help you do this. They are very careful in housekeeping and laundry so you can completely reassure that they entrusted them. Do not hesitate to book your ticket or rent a car to Furama Resort Da Nang to enjoy the holiday with the bests experiences in this place. Kha Tran car rental with professional services, 4 – 45 car seats new life, advanced facilities, modern always ready to accompany you. For more specific advice or rent cheap car to visit famous sites in Da Nang, do not forget to contact Kha Tran Car rental via hotline Ms Anna: (+84) 91 651 02 01 or Ms Katharine: (+84) 34 797 6789. Wish you and your family a happy journey and many memorable experiences in Da Nang.